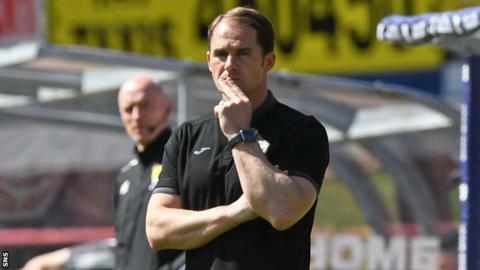 Alan Archibald will remain Partick Thistle manager despite the club's relegation from the Scottish Premiership, the Jags have confirmed. Archibald, 40, oversaw a top-flight campaign in which Thistle finished 11th with just 33 points from 38 games. Their demotion was confirmed by a 3-1 aggregate play-off final loss to Livingston. But chairman David Beattie is confident Archibald remains "the best person to help us achieve our objectives". The former Jags defender has a further year to run on his contract. He led Thistle to promotion to the top tier in his first season in charge in 2013, and secured their maiden top-six finish last term. In a statement released on Wednesday, Beattie said the club's focus was on returning to the Premiership at the first time of asking, and confirmed there would be "no non-playing staff redundancies" at Firhill. "For the club to succeed in the Championship and remain prepared for that return to top-flight football, we need to have a competitive budget that will fully match our aspirations," he said. "Because of financial prudence in recent years, we are in a position to provide that. "On the playing side the team needs to be rebuilt, effectively from scratch, and there is money in the budget to do that. In considering the best person to help us achieve our objectives, it is our considered opinion that Alan Archibald is still the best man to be the Thistle manager. "Alan steered the club to Premiership promotion and kept us there for five seasons, including a top-six finish - a feat not achieved by any other Thistle manager in at least 25 years. "His honesty in admitting that mistakes were made last season is the mark of a man of integrity and his commitment to this club has never been in doubt. "Alan indicated in the strongest terms that he wanted the opportunity to put right what has happened for the sake of the club. We believe he can do it and that he deserves that chance. "There will undoubtedly be those who feel we are being naive or lacking in ambition in making this decision. We are neither. It is our job to act in the best interests of this club - we believe keeping Alan Archibald falls under that heading. The board has faith and confidence in him and his ability to do the job in hand."